Worried about the health risks of a growing waistline? Have you tried what seems to be like hundreds of different ways to look and feel like your younger, more athletic self, only to fail? Are you sick of being stuck in a “dad bod” and want to actually like what you see in the mirror? Enough is enough. Now’s the time to finally cut the fat. I’m Zac Price, a personal trainer and nutritionist with 10 years of experience working with clients one-on-one in my own gym. I’ve helped thousands of men lose unwanted pounds and get into the best shape of their lives. Studies show, “Almost 3 in 4 men (74 percent) are considered to be overweight or obese” (1). I am on a mission to lower that dangerous number drastically. I’m here to tell you what you need to do today to drop pounds. So what is the simple solution to all of this? It starts by making ONE small change to your daily routine. Replace one high-calorie, fattening meal with IdealShake meal replacement shake. Great tasting meal replacement shake with only 230 calories and 2g of sugar. Controls hunger and cravings for up to 3 hours with 20g of Slow Digestiong Carbs, . No “deprivation” feelings… you get to enjoy dessert-like weight loss smoothies every day. 28g high-quality, all-whey protein helps you build lean muscle when combined with exercise, so you burn even more fat. You, and every guy in the world, suffers with this. It can sneak up on you in the middle of the night or while you're sitting at work. It hijacks your willpower and destroys your self-discipline. It is the #1 enemy of weight loss. Weight loss is all about controlling the beast of hunger so you don’t overeat, crave unhealthy food, or gorge yourself on snacks. In a scientific study done where men significantly dropped the amount of calories they ate (by roughly 50%), results showed that the “hunger made the men obsessed with food: They would dream and fantasize about food” (2). Starving yourself while leaving the beast of hunger untamed doesn’t work. You won’t lose weight. Slendesta promotes and extends your body’s natural release of cholecystoskinin (CCK) which sends signals to your brain saying you’re full (3, 4). 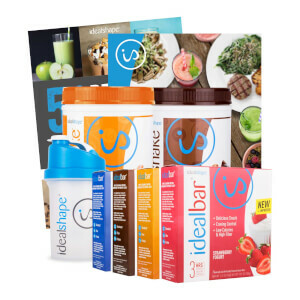 With IdealShake you’ll feel satisfied, so you're not tempted to keep snacking on everything in sight. Studies show that taking Slendesta will boost your weight loss, help you lose inches on your waist and hips, and increase your satiety (5). Along with the the hunger-blocking power of Slendesta we have included 5 grams of fiber in each serving of IdealShake. We included fiber into our IdealShakes, because it is a natural aid for fat loss (7). Fiber will help you feel full in between meals, lower your blood pressure, and reduce your appetite (8). So stop losing battles in the war on hunger and come off conqueror with the fiber and Slendesta in IdealShake! Why Should Men Choose IdealShake? Slow Digesting Carbs are included for longer lasting fuel. 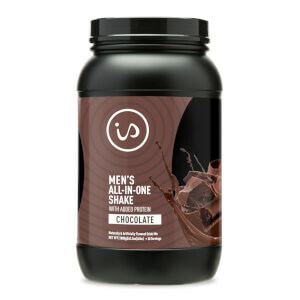 In order for Men's All-In-One Shake to help men build lean muscle, gain strength, and lose weight, protein is essential. Enjoy a delicious tasting meal replacement shake that contains only two grams of sugar. One of the things that money can’t buy is time. No matter how much money you save, you can’t bribe Father Time to give you more hours in the day to prepare healthy meals and exercise. Without Father Time changing things, you may feel there is simply not enough time to do it all. You wake up early to get to your job, work hard to bring home the “bacon”, deal with lazy coworkers, and by the end of the day you’re exhausted. It’s so much easier to eat out at the nearest fast food joint on your way back from a long day than spend hours preparing a healthy meal for your dinner and lunch the next day. Studies have shown that eating unhealthy fast food can raise your blood cholesterol, increase risk of heart disease, add unwanted body fat, and even lead to depression (9). To avoid these things you need to replace that greasy burger with a delicious, healthy meal. With three simple steps you can have a healthy meal to replace that artery-clogging burger in less than a minute. 1. Fill shaker bottle with milk or water. 2. Put one scoop of IdeaShake. It’s so easy you can make it in your car, running into work, or even during commercials while you're watching the game. What Makes IdealShake So Powerful? Most shakes only use fiber to fill you up, and skimp on the protein, leaving you hungry long before it’s time for your next meal. IdealShake attacks hunger in three ways: fiber, all-whey protein, and the powerful and proven 20g of Slow Digesting Carbs. This dynamic blend is exclusive to Men's All-In-One Shake and will keep you feeling full for hours! When you can control your hunger, cutting calories becomes simple, allowing you to see more results, faster. Now’s the time to ditch the “dad bod” and start liking what you see in the mirror. You don’t have to be the “chubby guy” anymore. Take control today with IdealShake! 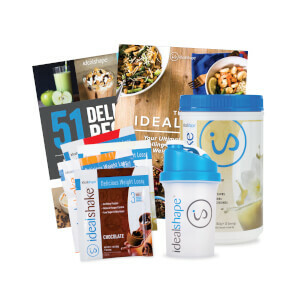 IdealShake is a great meal replacement shake to help block hunger and support weight loss, and while these delicious shakes provide 11-12g of protein per serving, you may be looking for more protein to add to your diet to help support strength and muscle building. That’s why we developed a new shake specifically for men: Men’s All-In-One Shake with Added Protein, a shake with 28g of protein and slow-digesting carbohydrates to help provide longer lasting fuel, so you can power through your work out. With our Men’s All-In-One Shake with Added Protein, each serving will give you everything you need in a super convenient shake to satisfy your cravings and help you stay energized. It’s time to get after your goals and maximize your results.